A few months later I bought a cheap reproduction of a winter evening landscape, which I called Pharmacy after adding two small dots, one red and one yello, in the horizon. In New York in 1915 I bought at a hardware store a snow shovel on which I wrote in advance in advance of the broken arm. It was around this time that the word 'ready-made' came to my mind to designate this form of manifestation. A point that I want very much to establish is that the choice of these 'ready-mades' was never dictated by aesthetic delectation. The choice was based on a reaction of visual indifference with the total absence of good or bad taste . . . in fact a complete anaesthesia. That sentence, instead of describing the object like a title, was meant to carry the mind of the spectator towards other regions, more verbal. . . .
Bibliography: The bibliography on Duchamp is immense. I content myself with the folloowing items out of the many. Anne d'Harnoncourt and Kynaston McShine, ed., Marcel Duchamp [Munich] Prestel . This is a reprint of the 1973 exhibition catalogue for a show organized by the Philadelphia Museum of Art and the Museum of Modern Art, New York (see Freitag #2449). It contains essays by Michel Sanouillet and others, an introduction by Harnoncourt, and a bibliography by Bernard Karpel. For Duchamps life, see CalvinTompkins, Duchamp: A Biography (NY: Henry Holt and Co., 1996). For his oeuvre, see 60. Arturo Schwarz & Marcel Duchamp, The Complete Works of Marcel Duchamp (NY: Harry Abrams, 1970). For an introduction to the debate about Duchamp, see Rudolf Kuenzli & Francis M. Naumann, (editors). 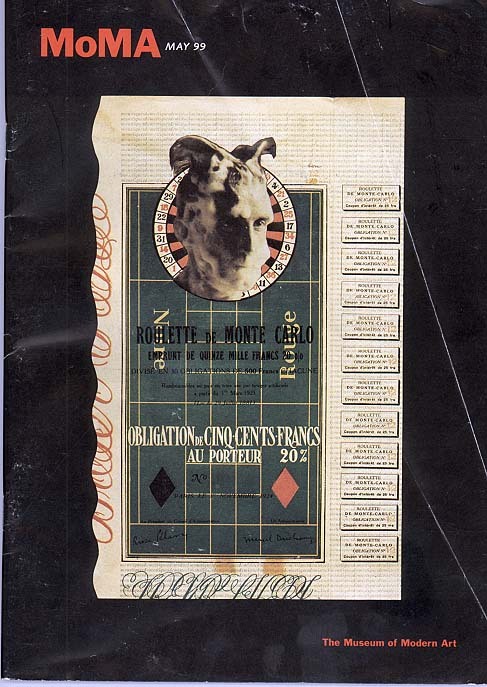 Marcel Duchamp, Artist of the Century (Cambridge/London: MIT Press, 1990), withtexts by B. Wood, A. Schwarz, F.M. Naumann, T. de Duve, W.A. Camfield, P. Read, C.P. James, G.H. Bauer, C. Adcock, H. Wohl, D. and Judovitz. 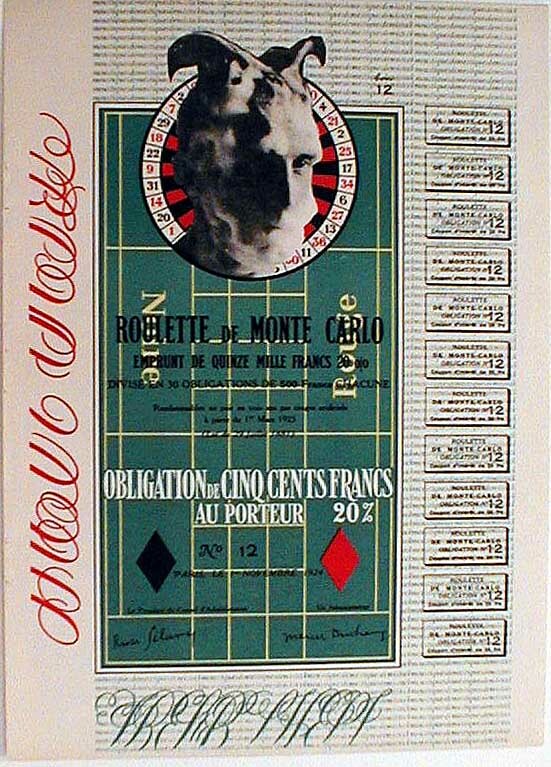 Marcel Duchamp, Obligation Monte Carlo reproduced on the cover of the May 1999 issue of the Museum of Modern Art members' magazine. 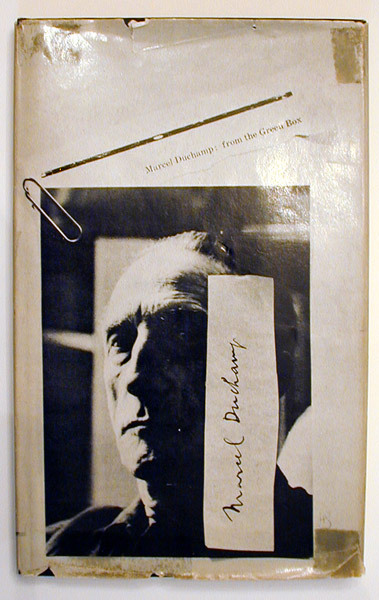 Marcel Duchamp, From the Green Box (New Haven: Readymade Press, 1957). 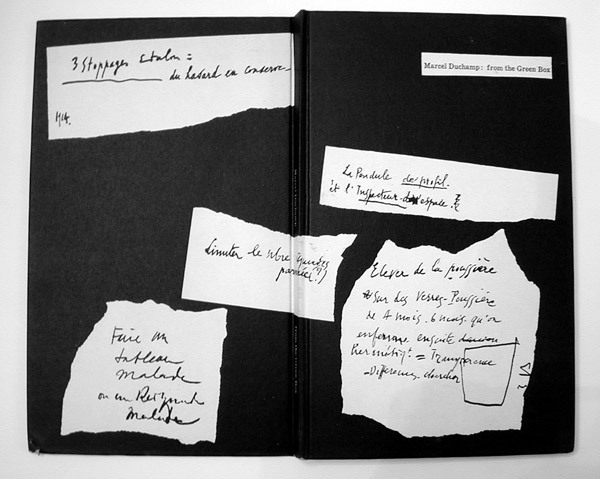 First edition of these notes for Duchamp's The Bride. Limited to 400 copies designed by Henry Steiner in the Graphic Arts Department at Yale University 8vo, original pictorial cloth, dust jacket designed by Henry Steiner. Book: VG condition; Jacket: several small tears and is stained from adhesive tape. The first publication in English of a selection of 25 of Duchamp's notes from the Green Box, relating to the conception of his large glass, La Maree mise a nu, familiarly known as The Bride. The sections were carefully chosen, but arranged in no particular order, reflecting their random appearance in the original green boxes. A very fine copy of the scarce first book of the Readymade Press. Price: SOLD.